Healey had requested the stay because she believes a parallel case against her 2016 decision to expand the definition of banned "assault weapons" should be decided first. U.S. District Court judge Timothy Hillman ruled the federal case deals with factors beyond those at hand in the state case. "The Enforcement Notice warrants constitutional review for vagueness without reaching the state law issue," he wrote in his ruling. 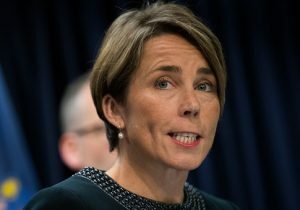 Healey announced on July 20, 2016, that she would be reinterpreting the state's decades-old "assault weapons" ban to expand what are termed "copycat" gun designs. At the time she accused the gun industry of using such designs to circumvent the ban. "The gun industry has openly defied our laws here in Massachusetts for nearly two decades," said Healey. "That ends today. We have a moral and legal responsibility to ensure that combat-style weapons are off our streets and out of the hands of those who would use them to kill innocent people." Healey's announcement included a test to determine if a gun meets the new "copycat" definition. "A weapon is a copy or duplicate if its internal operating system is essentially the same as those of a specifically-banned weapon or if the gun has key functional components that are interchangeable with those of a banned weapon," Healey's announcement said. The gun community criticized the new standard as vague, a violation of state rulemaking laws, and unconstitutional. "With the 2016 ‘Enforcement Action,' the attorney general's office demonstrated how little it understands about firearms," Lawrence G. Keane, National Shooting Sports Foundation senior vice president, said in a statement at the time. "Attorney General Healy and her staff clearly overreached their statutory authority and decided to legislate from that office without the benefit of any public process and in total disregard of 18 years of Massachusetts firearm law, under which firearm retailers operated. The attorney general undermined the state legislature by unilaterally declaring firearms that were legal to be illegal." Gun-rights groups, joined by gun retailers inside the state, filed their suit shortly after the change was announced. In reaction to Judge Hillman's decision to deny Healey's request for a stay, NSSF stood by its claims that Healey's actions were unlawful. "The actions of Attorney General Healy in 2016 were unconstitutional, leaving firearms retailers in Massachusetts unable to determine the meaning or scope of the Enforcement Notice and subsequent explanations," Keane said in a statement. "Because criminal penalties can result due to her unilateral reinterpretation of a state statute done without administrative process or input from affected parties, her office exceeded its lawful authority and retailers were deprived of their due process protections under the Fifth and Fourteenth Amendments."